Laser hair removal is a safe, fast and effective option for removing unwanted hair on various parts of the body. Laser hair removal is a safe, fast and effective option for removing unwanted hair on various parts of the body including the face, back, underarms, bikini line, legs and arms. Contact RTH Plastic Surgery in southeast Michigan today to find out more about your options. Conveniently located in Bingham Farms, Michigan, we see clients from Ann Arbor, Novi, Birmingham, Troy, Detroit and the greater Midwest. RTH Plastic Surgery is not only a leader in cosmetic surgery our skilled technicians offer many non-invasive options. A thorough consultation is an important first step when deciding if laser hair removal is the right option for you. We thoroughly discuss your desired results and provide an honest, professional opinion on how best to achieve those results. We also make certain that you are a good candidate for treatment, taking into account your skin type, age, health, medical background and other factors that could affect the safety and effectiveness of your treatment. All of our consultations are conducted with the goal of making sure our patients feel comfortable, confident and informed about laser hair removal. Four weeks prior to treatment, avoid sun exposure and do not wax, tweeze or use self tanning products. All treatment areas must be shaved as closely as possibly 12 to 24 hours before treatment. The day of your treatment, please remove all makeup and lotion before you arrive and wear comfortable clothing that allows for access to the treatment areas. Before your treatment, we will answer any questions that may have come up since your consultation. Every effort is made to make certain that all of your concerns are addressed and you are as comfortable as possible. You will be seated or lying down depending on what area of your body is being treated. During treatment, the laser selectively targets hair follicles, heating them with infrared energy. Many hair follicles are treated at once, making the treatment of larger areas very practical. 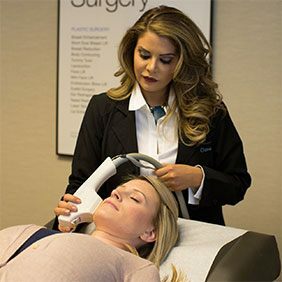 Our technology employs a unique, computer-guided scanning system that automates an optimal pattern and lays out parameters for the laser, allowing treatment to be performed rapidly and evenly. A cooling system is used to remove heat as it leaves the follicles so the treatment is as comfortable as possible. Since sensation varies from person to person, we can also provide a topical anesthetic if needed. Some redness and slight swelling may occur at the treated areas, however, this subsides within a few hours. To achieve optimal results and heal properly, avoid sun exposure for one week, keep the treated area clean, use SPF 30 when outdoors and follow all the aftercare instructions provided by RTH. Q: Is laser hair removal right for me? If you want to permanently remove hair from your body with a fast and safe treatment, laser hair removal may be the right option for you. Laser hair removal is most effective for people with light skin and dark hair. Q: Why choose RTH Plastic Surgery for my laser hair removal? When choosing a cosmetic professional for your laser hair removal, there are three important qualifications to consider: training, experience and personal attention. Dr. Hajjar is Board Certified by the American Osteopathic Board of Surgery in plastic and reconstructive surgery. Above all, your cosmetic professional should be someone you trust to deliver exceptional results and perform a safe and effective treatment. At RTH, our cosmetic technicians are laser hair removal specialists with years of experience performing the treatment. We spend the necessary time with every patient to answer any questions and address any concerns. We make it a priority to ensure that our patients are well-informed and completely comfortable with their decisions. We know that your time is valuable, which is why we maintain an efficient treatment calendar and use the latest techniques and technology to maximize results. Q: Will my insurance cover laser hair removal? Insurance companies commonly do not cover an elective or cosmetic treatment like laser hair removal unless it is performed to correct a medical or health condition. If you plan to use insurance as payment, we strongly suggest consulting with your provider to discuss if the treatment is covered in part or in full by your current plan. Q: Will my laser hair removal results look natural? Laser hair removal is a non-invasive treatment, providing results without the need for any surgical procedures, thus eliminating the possibility of scarring or other signs that a treatment was performed. During your consultation, we will thoroughly explain what results to expect. Results are permanent once a course of treatments is complete. Q: Can I have additional treatments in combination with my laser hair removal to enhance results? Yes, your RTH doctor can recommend additional services that may enhance your desired results, which can include chemical peels, laser skin resurfacing or other skin care treatments.